Chelsea striker Eden Hazard hasn't been in the best form so far this season. 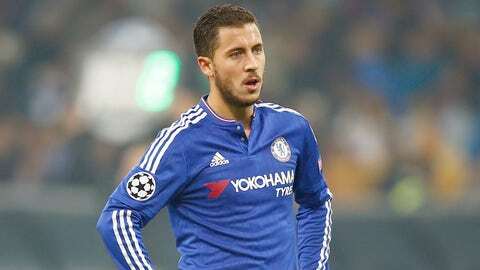 Chelsea fear midfielder Eden Hazard could be tempted by a £75million move to PSG. Manager Jose Mourinho is clinging to his job after Chelsea went into meltdown at West Ham. Bournemouth boss Eddie Howe has revealed he tried to sign Tottenham striker Harry Kane four years ago when he was in charge of Burnley. Manchester City boss Manuel Pellegrini insists his team are the biggest in the city, claiming "In the last seven years it has changed". Alan Pardew accused Leicester manager Claudio Ranieri of goading his Crystal Palace players and not shaking his hand. Arsenal are preparing a new contract for Arsene Wenger to keep him at the Emirates Stadium until 2019. The Gunners are also hoping to entice Patrick Vieira back to north London and groom him to succeed Wenger. Rio Ferdinand says Anthony Martial is the only Manchester United star the big teams fear. Tottenham are plotting a surprise January swoop for Leicester City hotshot Jamie Vardy. Arsenal are eyeing a transfer for Leroy Sane after Gunners scouts watched the Schalke teen score in the Europa League. Liverpool could go back in for Fiorentina midfielder Mario Suarez in January. Jose Mourinho’s future at Chelsea hangs by a thread after an extraordinary 2-1 defeat at London rivals West Ham on Saturday, where he was sent to the stands for confronting referee Jon Moss at half-time. Tim Sherwood’s future as Aston Villa manager was looking bleak following defeat at home to Swansea – his sixth successive Premier League loss. To make matters worse, a tunnel bust-up involving Micah Richards and Federico Fernandez will be investigated by the FA. Lionel Messi has refused to rule out an eventual move to the Premier League. Bayern Munich striker Robert Lewandowski has been reported anonymously to police for drinking champagne out of a bottle on the pitch during celebrations after Poland qualified for Euro 2016. West Brom manager Tony Pulis claims his prized striking asset Saido Berahino is still overweight as a consequence of his failed move to Tottenham in the summer transfer window. Liverpool are to open contract talks with right-back Connor Randall. Charlton are looking for their fifth manager in less than 20 months after Guy Luzon was sacked following Saturday’s humbling at the hands of Brentford. Southampton midfielder Gaston Ramirez is wanted by Italian clubs ahead of the January transfer window, according to his agent. Swansea are watching Burnley defender Michael Keane. Tottenham have stepped up their interest in £10million Belgium international striker Laurent Depoitre. Tim Sherwood is unsure over his Aston Villa future after the Swansea defeat left the club "in a hole". Liverpool manager Jurgen Klopp is set to discuss Mario Balotelli’s future with the Italian striker’s agent Mino Raiola. Eden Hazard’s rift with Chelsea boss Jose Mourinho has alerted Spanish giants Real Madrid and Barcelona. Manchester United are stepping up their interest in Serbia Under-21 midfielder Marko Grujic of Red Star Belgrade. Chelsea manager Jose Mourinho is likely to face another FA sanction after refusing to speak to the media following this side’s 2-1 defeat to West Ham.